Bath is a retiring English city which leaves visitors amazed and full of admiration. Highly regarded ever since the Roman period for the quality of its water, it quickly became a major spa resort within the United Kingdom. Its suggestive name reflects this omnipresence of water within the area. Elegant, delicate and opulent, Bath boasts numerous architectural designs of various genres. The Royal Crescent, a residential complex which includes 30 houses, and the semi-circle shape of which demonstrates how Georgian architecture can enhance a city which already boasts great beauty. Considered a sacred city by the Celts, Bath has always occupied a place in the lives of the inhabitants of East Somerset and on a wider scale, the English people. 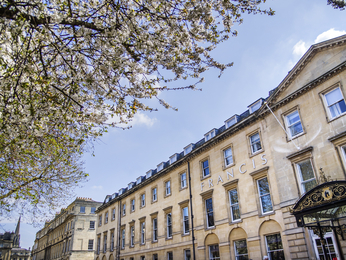 Recognised as a UNESCO World Heritage Site almost 30 years ago, Bath also represents a cultural and sports forerunner. Modern whilst wittingly able to endure various periods, Bath is a forward-looking city which offers visitors a host of activities. Amongst some of its remarkable sites, the chapel of Saint John the Baptist, a place which plays a leading role within the city. This humble building, boasting a captivating history, oozes natural charm, making it genuinely magnificent. The tower and pyramid-shaped roof make it unique and truly worth a detour and visit, whilst the chapel magnificently blends into a tree-filled and green setting. Bath Abbey is unquestionably the star of the city. Founded in the 12th century, it is emblematic of the city and a genuine achievement for its period. Its vaults and angels portray the ascension towards paradise bestowing this beautiful building with its divine character. All that is left to say is visit Bath to your heart's content and with vehemence.